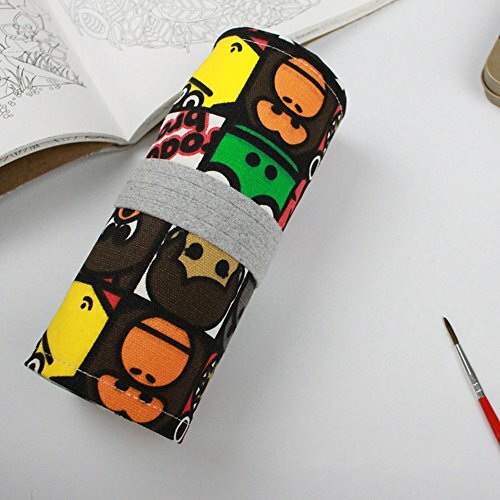 This wrap is soft to the touch and perfect for carrying and protecting your pencils. Complete with an elasticated rope closure, this roll-up pencil wrap features an attractive print design and bright colors that are a great addition of personality to this high quality product. Users will notice the excellent craftsmanship of this pencil wrap, made with a thick, sturdy canvas and complete with an anti-pilling design. You will be pleasantly surprised at how vibrant the fabric is, making it great for everything from everyday use to giving as a gift. Each pencil wrap also comes with fun, colorful beads for further personalization of the rope closure. PREMIUM Quality:The Pencils Storage Organizer is made from high quality Canvas that not only looks great,but will last for years to come.It will protect your pencils from damage and make them easy for carry.You don't have to worry that they will get scratched anymore. Best Pencil Storage Organizer. Feelily pencil holder Keep your pencils in organization and give your pencils more protections. Every time you want to use them, they are neat and organized in the pencil wrap for your choice. PERFECT GIFT - Perfect for students and a great gift for friends. PENCILS NOT INCLUDED- Please notice that the colored pencils are not included. If you have any questions about this product by Comfspo, contact us by completing and submitting the form below. If you are looking for a specif part number, please include it with your message.